LED bar display is actually like multiple LED, it is not like Arduino modules like TM 1637. Here is a guide explaining the basics, circuit diagram, code on Arduino and LED Bar Display. We need no extra library for the LED bar display but we need correct circuit and logically correct code to use this electronic component. Big advantage of LED Bar Display is it is quite cheap, we can use with IC like 555 instead of Arduino – we can use it without any programmable microcontroller. This component is useful to visually represent progress or quantity like in case with temperature, distance and so on. We can use this component with TM 1637 like 7 segment LED display simultaneously using the multiprocessing capability. We demonstrated multiprocessing capability of Arduino in TM 1637 traffic light timer. This Article Has Been Shared 3234 Times! 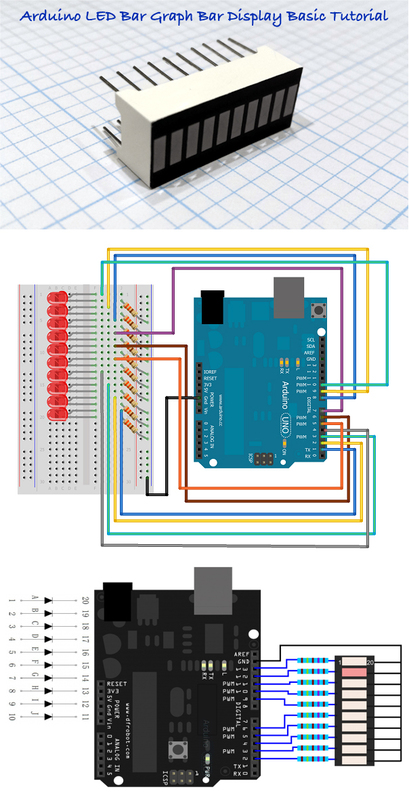 Cite this article as: Abhishek Ghosh, "Arduino and LED Bar Display : Circuit Diagram, Code," in The Customize Windows, September 26, 2017, April 21, 2019, https://thecustomizewindows.com/2017/09/arduino-led-bar-display-circuit-diagram-code/.